Owen was closely involved with Christ Church when his family was living in Birkenhead, including attending the Sunday School. His family moved away in 1906 when he was thirteen, but it’s clear that our church had a significant, formative effect on the young Owen as from 1911 to 1913 he went to work as a vicar’s assistant down in Berkshire. Owen was virtually unknown as a poet in his lifetime but his stature grew over the following decades, initially on a slow burn but igniting into full public recognition by the 1960s. His flame has since burnt ever more brightly. 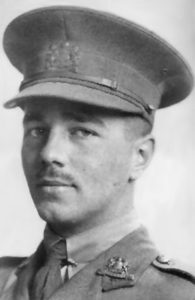 In honour and remembrance of Wilfred Owen’s attendance at Christ Church, a plaque was placed below the church’s war memorial during the 100th-anniversary commemoration of his death on 4th November 1918. Beautifully carved in blue/grey Welsh slate, the plaque is also a fitting tribute to the shared humanity of all those whose lives were lost in the conflict. The quotation is from Wilfred’s famous poem ‘Strange Meeting’. 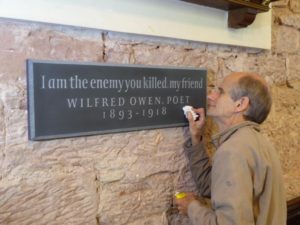 The plaque was hand-carved by master craftsman John Neilson who is based in Owen’s birthplace of Oswestry, a fitting personal connection. At the same time a series of banners was commissioned to commemorate Wilfred’s formative years here in Birkenhead and his literary legacy. You can see the banners here. Also on 4th November 2018 one of the community rooms under the church was rededicated in Wilfred’s memory in the presence of Dame Patricia Routledge and local MP Frank Field. A small display in the room explains the dedication to users of the room. You can see the display here. and the display in the Wilfred Owen room. As the display in the Owen Room explains, Wilfred’s religious experiences at Christ Church and his fervent Biblical studies shaped his writing for the rest of his life. 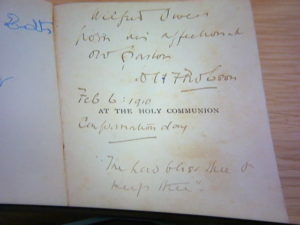 His closeness to the famous vicar of Christ Church, Canon Robson, endured for several years after the family moved away from Birkenhead, as reflected in the very warm inscription to the Communion Book Canon Robson sent to Wilfred in 1910. 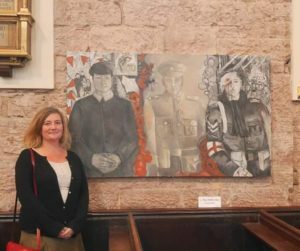 On the wall adjacent to the war memorial is ‘Boy, Soldier, Man’ an original painting by Marie Mairs symbolising the journey of young men during the First World War. You can read more about her painting here. At a special organ recital held to commemorate those lost in the Great War, our organist, Paul Broadhurst, played a number of pieces by composers of the period. You can hear them on YouTube by clicking the appropriate link. Sospiri by Edward Elgar, written in 1914 on the eve of the First World War. Gaudeamus by F. Maurice Jephson, killed during the First World War at the age of 31. Two Songs from A Shropshire Lad by George Butterworth, killed during the First World War aged 31. To learn more about these and other First World War composers, please read the recital programme.